Happy Monday! I hope you all had a wonderful weekend! On Friday, my husband and I got to try out a new restaurant in downtown Greensboro for our date night. It was called Blue Denim and it was Cajun themed and so delicious! The atmosphere was absolutely perfect for a date, too. If you're local, you must try it and the fries. They are too good! The weather on Saturday and Sunday was out of the ordinary for the month of February. I guess I should be used to random weather since I've lived in North Carolina my whole life. One day it's 70 then the next it's only 40. You definitely have to check the weather forecast around here before getting dressed! 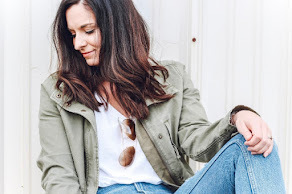 But I took full advantage of this spring preview and busted out some of the new additions to my closet while it was warm enough to wear them. My top and wedges are both recent purchases and already favorites! 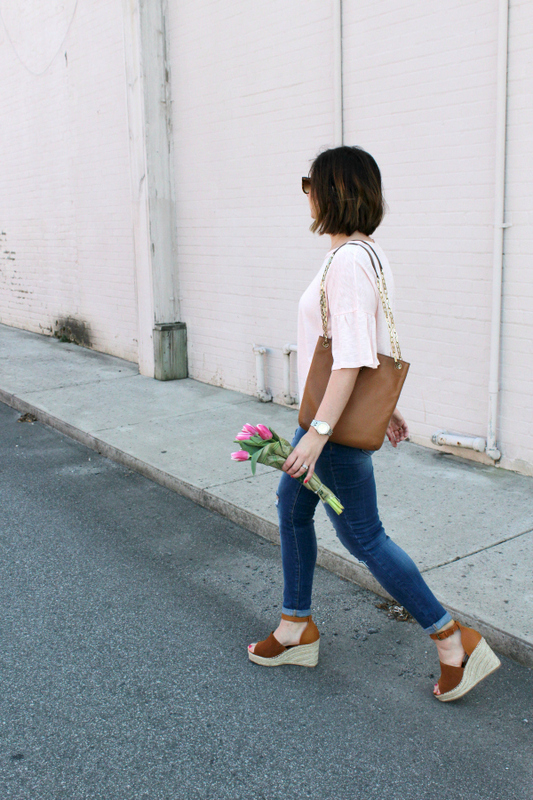 The wedges are going to be on repeat all spring and summer long. The best thing about them is that they are under $60 and look so super similar to the Marc Fisher ones that are over $100 more. They also come in black (which I think I need too) and run true to size! 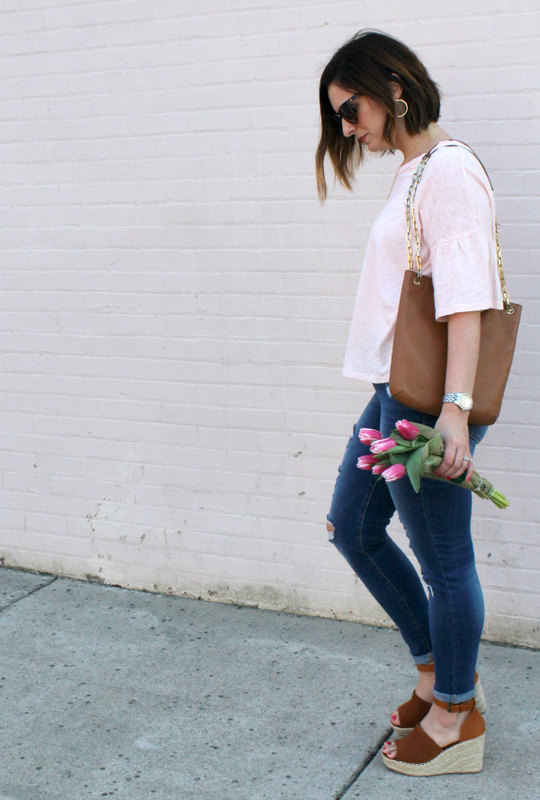 The blush color of my top is a color that I am gravitating towards right now. I have always loved pink and I love this soft shade. 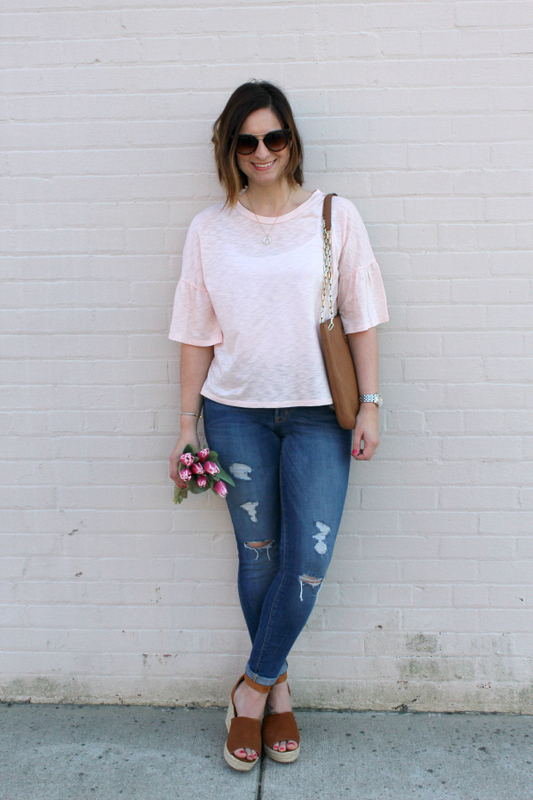 I also love the extra feminine ruffle sleeves that take this very simple tee up to the next level. I'm glad I enjoyed these spring pieces yesterday when it was eighty degrees because today is supposed to be 20 degrees cooler. 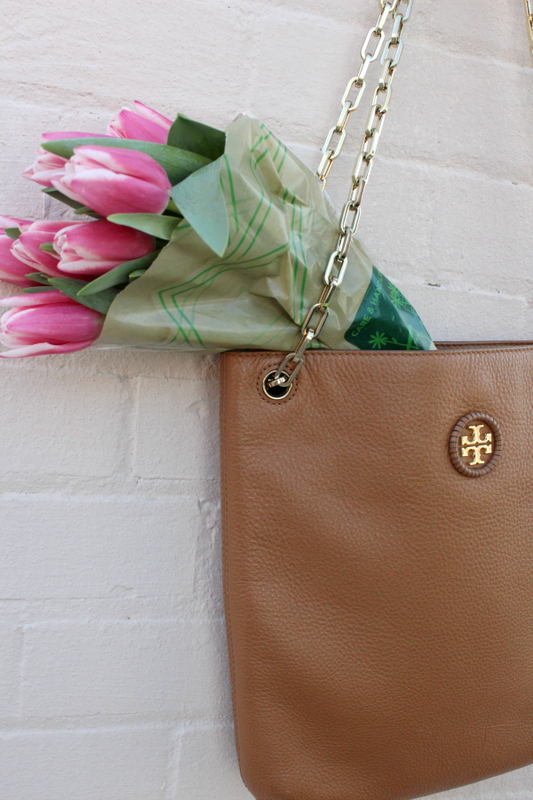 This spring preview was such a tease... bring on spring. pretty please! Love this Emily! The tulips are gorgeous! These wedges are perfect I love these flowers so pretty! Love trying out new places with the hubs! 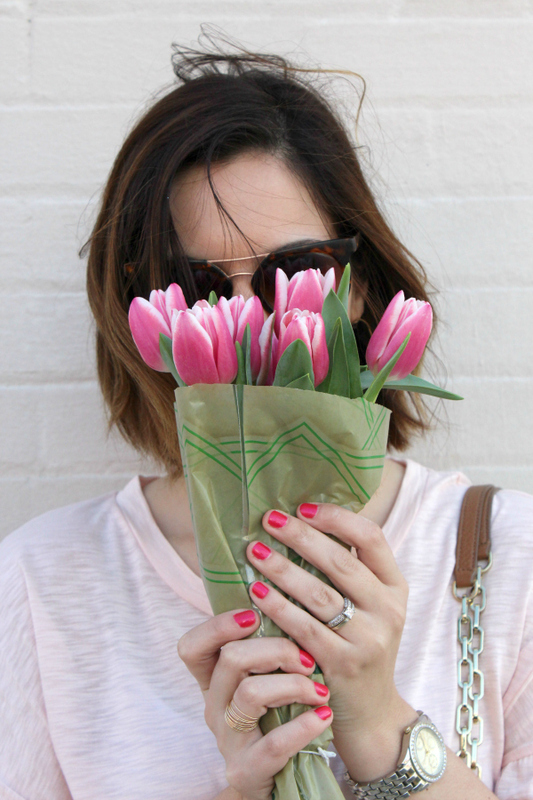 This is such a cute spring look! I have been wanted those shoes for a while. Now your post is going to make me pull the trigger! so cute. 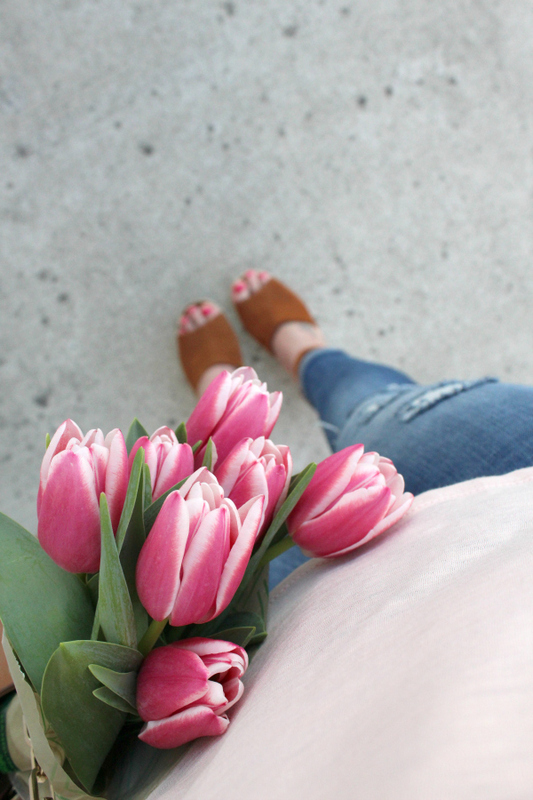 and tulips are my fav! 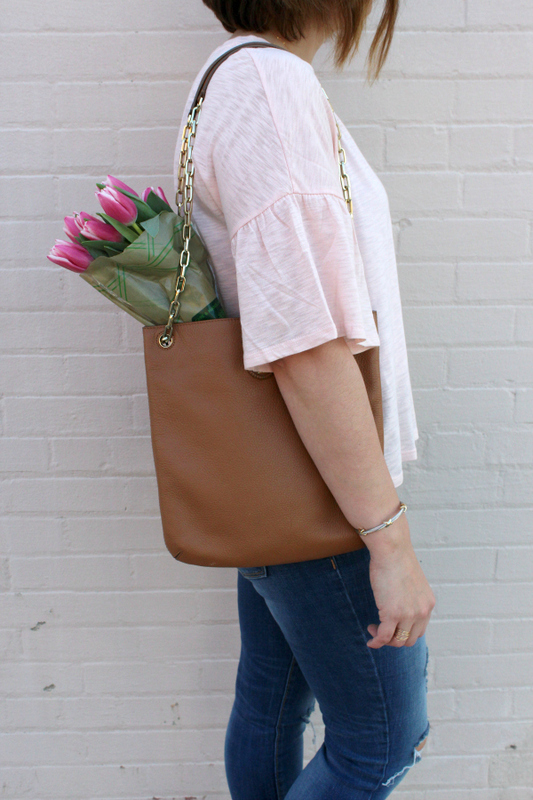 What a gorgeous casual spring outfit! You look so cute girl! I love those wedge sandals! They look so comfortable and so supportive too! Ordered these in two colors - now I want the third color! They look so comfy! Such a cute outfit for spring! 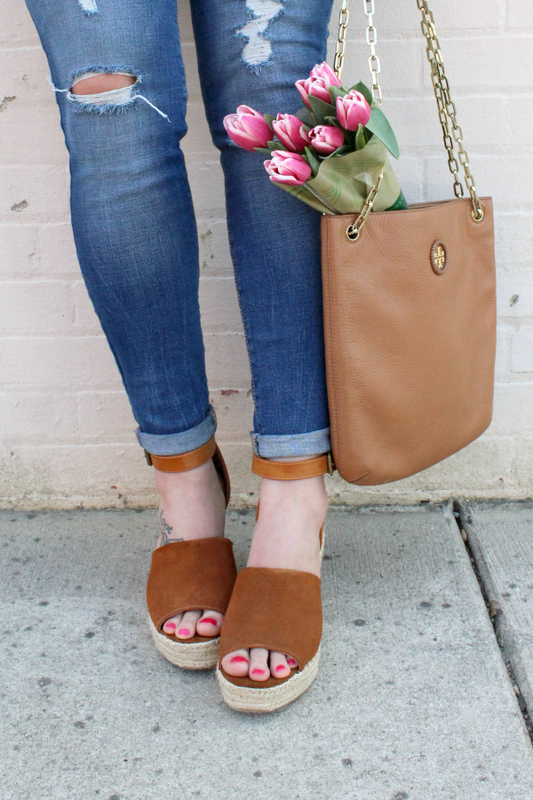 I love those wedges and the tulips add a really nice touch! I couldn't keep my eyes off your feet --- NEED those sandals!